Let’s get these facts and opinions out of the way before we even get started; in my time I have seen more Broadway shows than the average person, I had a moderately successful career in musical theater during the first part of my life and, in recent years, Jersey Boys is one of the best shows I’ve seen on stage. It’s also important to note that I have always been of the opinion that properties originally created for the stage rarely transfer well. Plays often feel too claustrophobic and talky on screen and musicals tend to lose much of their real time magic when committed to celluloid. All that being said, as much as I enjoyed Clint Eastwood’s Jersey Boys, the film version of the hit musical didn’t do anything to change my mind in this regard. On stage the musical dazzles as a seemingly impossible mix of kitchen-sink drama and Las Vegas glitz but, on screen, it all plays more like a standard bio-pic and, as a result, comes off a little long winded and flat. The monochromatic look of the film, both in the cinematography and lighting doesn’t help and, while I can certainly appreciate the nostalgic tone Eastwood was attempting to capture, the dullness and fog of this style distracts more than it compliments the story. If Eastwood was actually looking for a way to ground the musical in reality while still maintaining it’s theatricality, playing the first half in black and white before eventually transferring to color, ala The Wizard of Oz, might have been a more interesting and effective choice. One of the most brilliant aspects of the Tony Award winning musical is how long the show’s authors make you wait before they give you any music that sounds vaguely familiar. On stage the first Four Seasons‘ hit you hear arrives late in the first act, approximately ten minutes before intermission. For a “jukebox musical” it’s a bold choice, one that I have admired from the very first time I saw the show. Thankfully Marshall Brickman, adapting his stage play for the screen, maintains this element and continues to build the anticipation nicely so that, when “Sherry” finally does arrive in the film, the moment is just as satisfying and smile-inducing as it is live and in person. 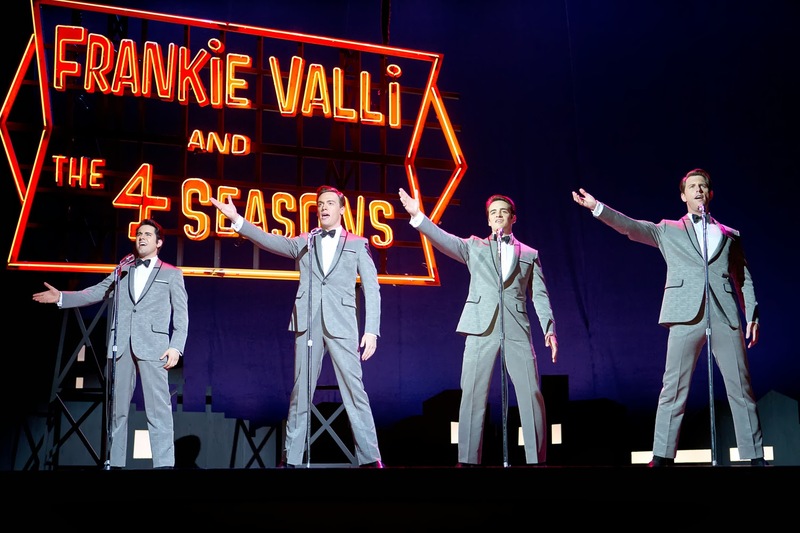 While the background stories of the boys from Jersey are interesting enough, the star of both the stage musical and the film is the music of Frankie Valli and the Four Seasons and, in that regard, the big screen adaptation more than lives up to it’s predecessor. It’s been noted that all the singing in the film was done live and, unlike last year’s problematic Les Miserable, this time around that concept actually works. Of course it helps that the majority of the actors in the film have more experience singing and playing their roles than is usually the case. John Lloyd Young, who won the 2006 Tony Award for his star turn as Frankie Valli, gets the opportunity to commit his award winning performance to film and rises to the occasion nicely. Young makes the required adjustment masterfully and never feels too big or theatrical in the film, though his young Frankie is still much more believable and comfortable than his older version of Valli, which, even on stage, always felt a bit more affected and forced. Vincent Piazza does a fine job in the love him/hate him role of Four Seasons’ founding father Tommy Devito, Erich Bergen as Bob Gaudio, the Four Seasons’ primary songwriter, gives a solid performance that should earn the actor more screen time in the future, and Michael Lomenda as Four Season Nick Massi rounds out the quartet with equally impressive work. Christopher Walken, as mob boss Gyp DeCarlo, doesn’t show us anything new or groundbreaking from his palette but he’s the perfect, (and most obvious), choice for the role and there’s just no denying it’s always a lot more fun when Walken is in the mix, particularly when it comes to the big screen musicals. It should be noted: my mother accompanied me to the screening of Jersey Boys the other night, which was actually more than perfect given she was the one who took me to my very first concert in 1975, (which just so happened to be, Frankie Valli and the Four Seasons, front row, no less!) Unfortunately, I have never had the opportunity to take her to see the musical live on stage so this was a must see for us both, together. After the credits rolled, our verdicts were declared; I, who have had the pleasure of seeing the show on stage, liked it, while mom, who only had the movie to reference, loved it. In a nutshell, that’s probably all you need to know if you’re trying to decide whether you should be heading out to the multiplex for this one. Mom mentioned near the end, it was all she could do to stay in her seat, she really wanted to dance and clap along during that rocking finale, I didn’t have the heart to tell her, in the live theater we do and we did. In the end, that’s probably the biggest difference and- make no mistake- it’s a BIG difference. It’s fine that Hollywood wants to capture some of that Broadway magic, (and money), on the silver screen but it’s probably time we all give up on the experiences being anywhere near the same, or even equal.